Or, il n’y pas d’annexe B, uniquement une annexe A avec la liste des participants. @claudex Exact, l’annexe A avait été supprimée au dernier moment, faisant que l’ancienne B devienne A. Merci, c’est corrigé. Lorsqu’on est soumis à une sérieuse #attaque_par_déni_de_service volumétrique, il faut parfois sacrifier la machine qui en est la cible, afin de préserver le reste des ressources réseau. On demande alors à son opérateur de jeter le trafic à destination de cette machine, avant qu’il n’emprunte la liaison qu’on veut préserver. Cela peut se faire manuellement mais c’est évidemment plus rapide et moins risqué si on le fait automatiquement, via une annonce #BGP vers le préfixe visé. Pour cela, on marque l’annonce BGP avec une communauté qui veut dire « poubelle donc tout ce trafic ». Ce nouveau #RFC normalise une communauté standard, « bien connue », pour cela, BLACKHOLE (0xFFFF029A). Ainsi, il n’y aura plus besoin d’utiliser une communauté différente pour chaque opérateur. Grosse attaque par déni de service contre l’important hébergeur #Linode. Exceptionnelle par sa durée (plusieurs jours) et son intensité. I’d like to share some updates about the recent DDoS attacks. I am one of several network engineers at Linode who have been working around the clock on DDoS mitigation. While things are stable, I would like to take a moment to publicly address the large and frequent DDoS attacks that we have been receiving since Christmas Day. All of these attacks have occurred multiple times. Over the course of the last week, we have seen over 30 attacks of significant duration and impact. As we have found ways to mitigate these attacks, the vectors used inevitably change. As of this afternoon, we have mostly hardened ourselves against the above attack vectors, but we expect more to come. We are working extremely closely with all of our technical partners, including our network equipment vendors and our colocation providers, to prevent future attacks. Once these attacks stop, we plan to share a complete technical explanation about what has been happening. Additionally, we will be announcing the details of an ongoing project to significantly improve our internet connectivity and resiliency. We would like to apologize for the lack of detail in some of our recent status-page updates. Please know that we are dedicating all resources from multiple departments to stopping these attacks. We acknowledge the amount of downtime we’ve been experiencing is completely unacceptable, and we appreciate the understanding and support we have received over the past several days. We will share more information as our investigation continues. I guess the DDoS also served as a cloak for other types of attacks: a possible data breach has lead Linode to expire all customer passwords because of unauthorised logins on there customer accounts. @erratic Quite possible. dDoS attacks are often used for that. On a beaucoup parlé des attaques #DoS par réflexion + amplification en les présentant souvent comme spécifiques à #UDP. Mais un article récent (mais passé curieusement inaperçu) montre qu’on peut en faire également avec #TCP. DDoS amplification attacks currently typically use UDP-based protocols with spoofed source IPs. The reason being that there is no 3-way handshake in UDP. However, it turns out there are TCP-based protocols are also vulnerable to amplification attacks. Better even, the handshake itself can be abused for amplification. Authors of the 2014 research mentioned in Stéphane’s article (and below) have identified 4.8 million devices vulnerable to an average TCP-based amplification factor of 112x. 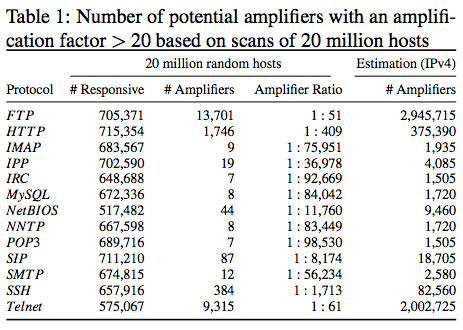 Of those, they identified thousands of hosts that can be abused for an amplification of almost 80.000x. They identified that there are hosts responding to a SYN with an excessive amount of RST packets, and others that transmit actual payload data via PSH packets – even before the three-way handshake has been completed. From the point of view of an attacker, the number of amplifiers is important to scale up the overall attack bandwidth. Compared to UDP-based amplification attacks, the fact that there are much more amplifiers makes this form still the most attractive. An attacker has to scan many more IPv4 hosts in order to find a large enough number of TCP-based amplifiers. Why would TCP-based amplifiers be interesting? • They could be interesting to attackers who have little bandwidth available and who want to amplify as much as possible. • Also, TCP traffic is considerably harder to filter at the network edges than UDP-based protocols. It is not easy to make a difference between legitimate and malicious TCP traffic without appliances that keep trace of and inspect the states of TCP connections. • Another reason why TCP-based is more complicated is that TCP-based amplification traffic does not carry payload that can be inspected for validity. SYN/ACK: The majority of amplifiers cause amplification by repeatedly retransmitting SYN/ACK packets upon our SYN segments. This attack type amplifies traffic up to 80x on average, and for SIP even up to 1,596x. PSH: The number of amplifiers that transmit payload data via PSH (without a completed handshake) is low for most protocols. Nevertheless, the amplification factor is higher compared to the SYN/ACK amplifiers. RST: The by far highest amplification is observed for hosts that transmit a tremendous number of RST segments. As such, an attacker could abuse the 4,242 vulnerable Telnet hosts to achieve an average amplification rate of 79,625x. Compared to SYN/ACK, the RST amplifiers of most protocols also have a much higher traf- fic volume—even though the number of hosts is significantly lower. That is, the 8,863 SYN/ACK amplifiers of NetBIOS transmitted about 25 MB of traffic, while the RST amplifiers caused traffic of more than 12 GB. Similarly, even though we observed most of the FTP ampli- fiers sending SYN/ACK packets (causing a total of 3.2 GB of traffic), the RST amplifiers transferred 15.1 GB of traf- fic in the same amount of time, a multitude of factor 5x. Lorsqu’on a un grand réseau compliqué, diffuser à tous les routeurs des règles de filtrage, par exemple pour faire face à une #attaque_par_déni_de_service, peut être complexe. Il existe des logiciels permettant de gérer ses routeurs collectivement mais ne serait-il pas plus simple de réutiliser pour cette tâche les protocoles existants et notamment #BGP ? On profiterait ainsi des configurations existantes et de l’expérience disponible. C’est ce que se sont dit les auteurs de ce #RFC. « #FlowSpec » (nom officieux de cette technique) consiste à diffuser des règles de traitement du trafic en BGP, notamment à des fins de filtrage.